Whether you are vegetarian or are entertaining vegetarian guests, it is nice to serve a few meatless tapas at your gathering. This way there is something for everyone—from cheese-lovers to garlic lovers. Most recipes are simple and easy and some do not require any cooking at all. This roasted red peppers in oil, vinegar, and garlic recipe is a verduras aliñada, a marinated vegetable salad. It is also the perfect example of how using just a few simple ingredients can have a big impact on a dish. 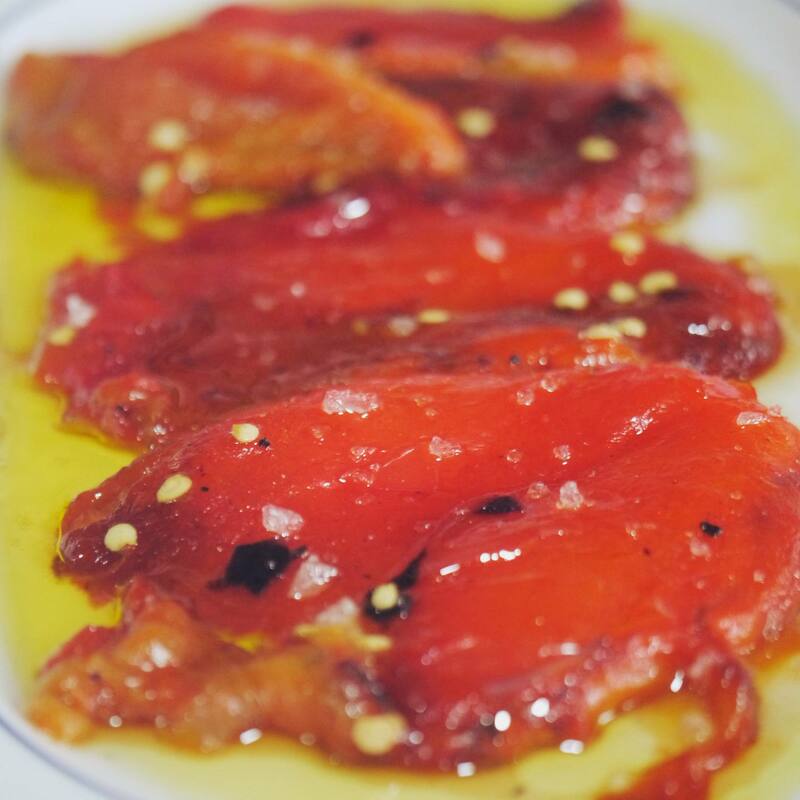 By marinating roasted peppers in Spanish sherry vinegar, minced garlic, and extra virgin olive oil, the bright red vegetable takes on delicious and complex flavor. Serve room temperature or cold on a platter with slices of rustic bread. Like summer on a plate, this grilled eggplant in tomato vinaigrette tapa highlights the foods of the sunny Mediterranean. Eggplant is broiled (or grilled) and topped with a tomato-basil sauce studded with capers, garlic, and onion. This is a great make-ahead dish, which you can take out just before serving. All these little fried padrón peppers from northwest Spain need is a quick fry and a sprinkle of coarse salt to become a delicious tapa everyone will love. For the most part, green padron peppers are mild, but depending on where they are grown you can come across a spicy one. They are a specialty of Spain so if you have trouble finding them you can substitute Japanese shishito peppers. Instead of coating the florets with a thick batter, this recipe calls for simply dipping steamed cauliflower in beaten egg and lightly dusting with flour, making for a light, tender, and crispy tapa. The cauliflower pieces are quickly pan-fried until brown on all sides. Serve this Spanish fried cauliflower with creamy, garlicky alioli sauce, or another Spanish sauce for dipping. 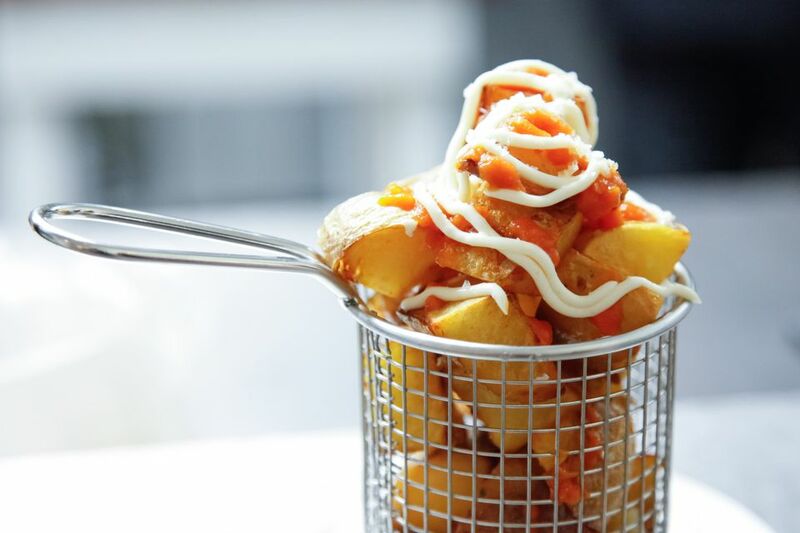 Always a favorite and one of the most popular tapas in Spain, patatas bravas, may have several variations but are always spicy (hence the "bravas," or "fierce.") Little wedges of potatoes are fried until crispy and then served warm covered with sauce made of tomato, paprika, Tabasco, and garlic. Serve these Spanish "fierce" potatoes with small forks or toothpicks. This is a garlic lover's tapa—fried, warm chunks of potatoes are smothered with alioli sauce, a garlic mayonnaise. Traditional Spanish alioli includes only olive oil and garlic which gets its thickness from intense emulsifying so this alioli potatoes recipe includes egg yolks to speed up the process. You can serve patatas alioli with patatas bravas as the "bravas" and alioli sauces will compliment each other. This Spanish goat cheese is firm, similar to feta, and when marinated in a mixture of olive oil and spices, takes on wonderful flavor. Put the mixture in the refrigerator and let sit overnight so the garlic, thyme, and rosemary have time to infuse into the oil. Serve this cheese in olive oil with slices of crusty bread. This goat cheese with paprika, garlic, sun-dried tomatoes, and capers recipe is perfect to have for those last-minute get-togethers. This recipe uses soft goat cheese and mixes it with roasted garlic and paprika to create a flavorful cheese with a pinkish tint. The tangy, creamy goat cheese combines perfectly with the rich flavor of roasted garlic and the salty flavors of the tomatoes and capers. Spread the cheese over slices of bread and arrange sun-dried tomatoes and capers on top. Salmorejo is a classic cold tomato soup that originates in southern Spain and is popular throughout the country. A summer staple, it's one of the most popular hot weather tapas in Spain along with its more liquid cousin, gazpacho. Traditional salmorejo is topped with hard boiled egg and diced ham, but there are other versions that are topped with tuna. There's nothing more traditional than a freshly made tortilla de patatas, the classic Spanish omelet made with eggs, potatoes, and onions. At a summer barbecue in Spain there is always tortilla de patatas on the buffet, usually sliced up and served room temperature. Every family has its own recipe, and everyone claims that theirs is the best. The secret to a fantastic Spanish omelet is having the best quality ingredients—farm fresh eggs, the right potatoes, and extra virgin olive oil. Vegetarians can get creative with add-ins like mushrooms, asparagus, and bell peppers. A safe bet for vegetarians in Spain is usually mushrooms, called setas. Spaniards love mushrooms of all types and they are prominently featured in seasonal cuisine, whether simply prepared with minced garlic or scrambled in a revuelto (a scrambled egg dish). Mushrooms make the perfect alternative to meat when barbecuing, too! In this mushrooms with garlic recipe, mushrooms are sauteed in oil with garlic and then simmered in a bit of white wine. The mixture is delicious served on slices of toast. Summertime in Spain means lots of fried foods, especially fish. But vegetarians don't miss out, as there are plenty of fried vegetables on offer too. One of the favorites is the savory fried eggplant with honey or sugarcane syrup (miel de caña). The dish is a delicious mix of sweet and savory that will leave you wanting more.